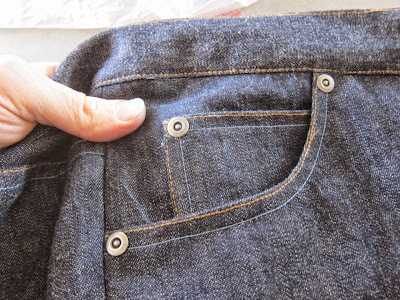 OMG, guys, I did it -- today I successfully inserted jeans rivets! 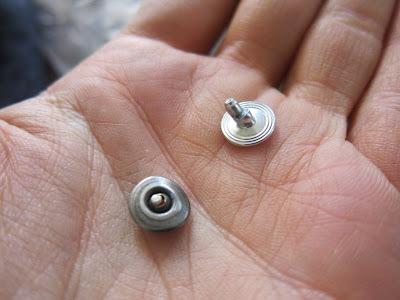 To give credit where credit is due, I used Taylor Tailor's excellent rivet tutorial. If I'm not mistaken, I believe my rivets came from Taylor too. He sells them from his online supply shop. I had three types: shiny silver, black, and antique nickel finish. I opted for the antique nickel. My first attempt was a total fail, but it was also my only fail. 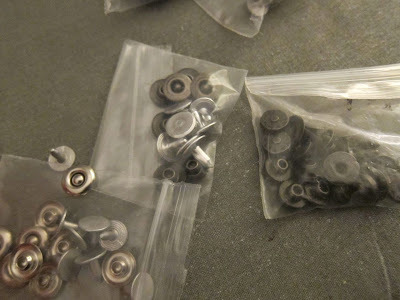 I immediately realized that, given the length of the rivet (the sharp pointed part), I was going to need some spacers. I tested using a few additional layers of denim and it worked. The layers also helped hold the rivet straight so that it entered the cap at the correct angle. 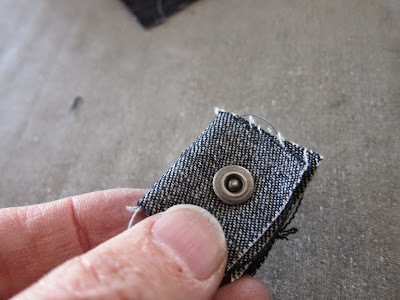 It seems to work better to err on the side of more layers (as opposed to less) as the denim can always be squished down to expose enough of the point to fasten to the cap. 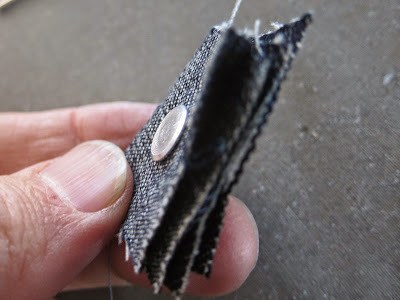 Once I had a successful test, I started inserting the rivets on my jeans, at the corners of the two front pockets and on the single coin pocket. 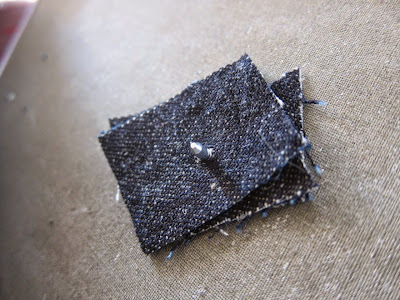 I poked through the layers of denim with a sharp nail just a bit wider than the rivet point. 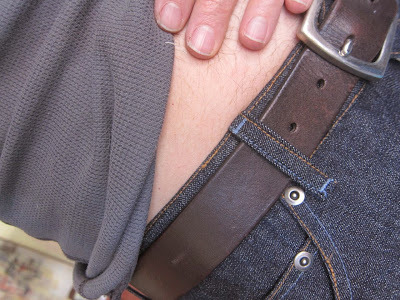 Then I pushed the point, spacers attached, through the pants themselves. I placed the point down on the cap, which sat on the cement floor of my balcony. I hammered a few times on the back of the rivet, just to make sure the rivet was going in straight. When I was sure the angle was right, I gave it a few more heavy blows -- no more than six to eight. 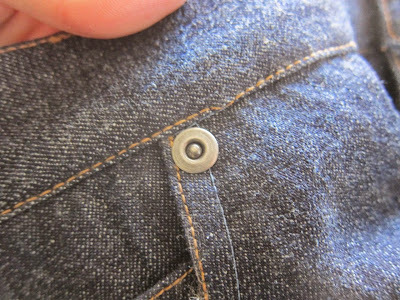 The rivet cap should feel secure and tight on the denim. I chose not to trim my spacers as neatly as Taylor does, but I did trim them some. Nobody will see them inside my pants. 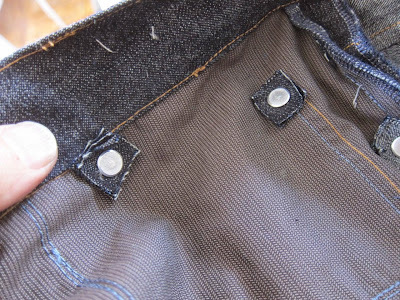 Once my rivets were attached, I added my jeans button, buttonhole, and belt loops. I need to machine wash and dry these once more before hemming, but I'm very happy with the result. Stay tuned for a formal jeans reveal later this month. 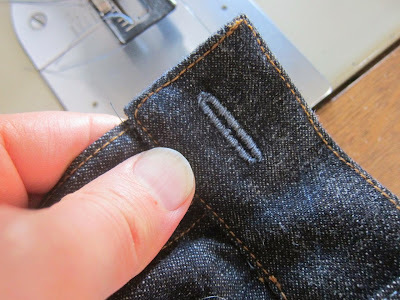 Afraid of inserting rivets? If I can do it, so can you. Great job! Store bought jeans never fit me. I should try to make some. Thanks for the inspiration Peter! They look awesome. You truly are the King of Jeans. Thanks for the photos and explanation. Your rivets look great and I'm looking forward to the fashion show. Great looking jeans, Peter! I like your choice of top stitching colors on the back. They look great! I've been tempted to try making jeans but I never wear them so not much motivation. With your new found skill, is it time for leather jeans?? Maybe my rivets just had a longer spike -- I wonder if they're a standard size. You did a great job. One day I'll get around to having to complete this task. Your jeans look fantastic! Thank you for sharing all of the info about the rivets. They look great! So professional. 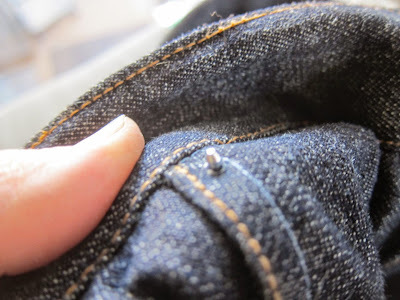 I've made jeans but never with rivets. So exciting! I've always wanted to make jeans as I'm nearly six foot and it's painful to try buy them. 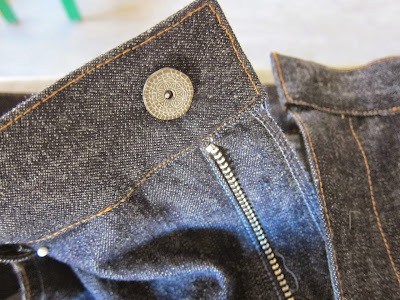 Did you use commercial denim fabric and if you did where did you buy it? I want some! I purchased my denim at Mood Fabrics here in NYC. 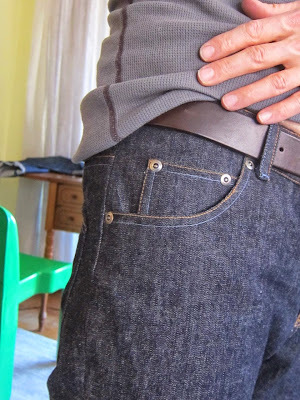 Yes, I think it's commercial denim, though it's relatively lightweight. Tailor Taylor (the blog link with the riveting tutorial) sometimes sells US-made denim in his shop, although it is closed at the moment. You can also order US-made denim from Pacific Blue Denims. I haven't ordered from them as I live in Australia, but from the UK postage shouldn't be too bad, I hope. Oooh thank you! I will check them out, jeans are always so hard to find! 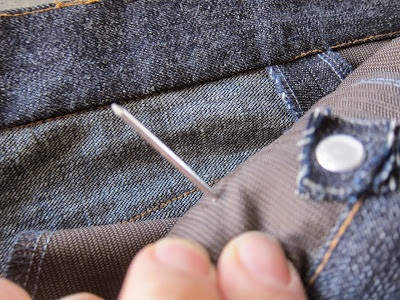 I'm starting a new pair of jean tomorrow I'll give this a try. Up until now my rivets all have gone in crooked and some have sharp points or burs that occasionally catch on things. I think I understand what I've been doing wrong which is no spacers. As I mention in the post, the spacers also serve to keep the point in position so it's less likely to go in crooked. Good luck! 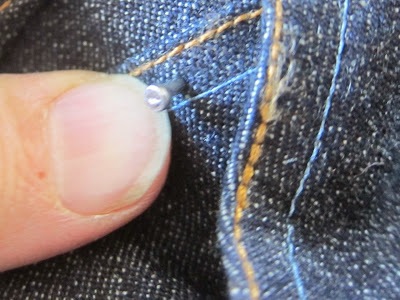 On which machine did you stitch these jeans?